! HANDY HOUSEHOLD HINT ! newest edition of that page. The WOW BROTHERS (davey wow on L, tommy wow on R) in all their Glory! Well, at least in ~some~ of their Glory ... ? W o w W e b C e n t r a l ! Davey and Tommy have been best pals - 'Brothers', if you will - for nigh on a bazillion years now! Their latest musical endeavor is The Wow Brothers, an acoustic guitar duo with snippets of Davey on harmonica, ukelele, spoons, and washboard, and sometimes even Tommy on saxophone. 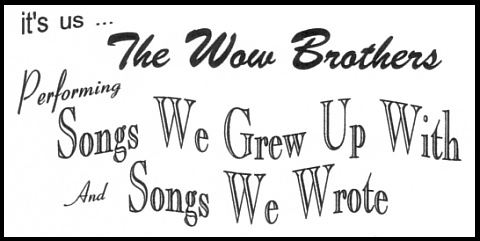 They play mostly songs from the 60's & 70's, mixed with a slight dash of 80's & 90's, plus a sprinkling of bigband & country, and a little pinch of odds & ends ... not to mention original material from their various cd's, which just might be the best part of time spent with The Wow Brothers! new compositions for their latest cd ! But now they've laid aside their Royal Sceptre and stepped down from the dais, having symbolically removed their crown (which was heretofore perched jauntily atop their collective head), given it a quick spitshine, and gently placed it upon the seat of the throne, where it awaits the head of the next musical monarch. Until that potentative successor is chosen, the top spot in Duo Land is wide open, and the landscape is rife with the elbowing, rude gesturing, and cat-calling of all who were coveting the kingdom during those many years when it was oh-so-unattainable because The Wows had such a firm stranglehold on it. Who will eventually emerge victorious from this scrum to claim the bejeweled headpiece is anybody's guess. The Wows, however, are not guessing, nor are they even paying attention, because they each have their own individual futures on their minds, and they are simply getting on with the business of living them. Yes, they do wish Godspeed to whomever takes over in their stead, but beyond that, it makes no never-mind to them how the coup plays out. This reporter met up with The now-ex-Wow Brothers during a recording session at Davey's Shed Your Inhibitions Studio, aka SYIS, one of two recording studios they use (the other is Tommy's KAOS studios, aka Kelley's Attic O' Sound). They were working on a song for Davey's latest solo project, and as I watched unobtrusively from an out-of-the-way cranny, I saw their work ethic had that same light-hearted camaraderie they demonstrate so effortlessly in live performance, combined with an unerring, businesslike focus on achieving the exact sound and mood they've envisioned for the piece - which, incidentally, was a tunefully jangling, mid-tempo tropical-rock composition that, in my humble opinion, could easily attain the top of the 'seaside charts'. Just as I was beginning to think they'd forgotten I was even there (quiet as a mouse, I was, so's not to disturb their thought processes), Davey called a break, and within a minute-and-a-half, they were seating me at the 'comfort table' in the control room, and making sure I had sustenance in the form of bottled water, celery stalks with cream cheese, crisp Red Delicious apples...also fresh-from-the-oven Hawaiian pizza, soda, sea salt potato chips, and Snickers Peanut Butter bars (I could go healthy, or go in the other direction; I mixed it up with a slice of pizza, some chips, a candy bar - and for the healthy part: bottled water!). "We've spent a long & enjoyable tenure frolicking through the sunny meadows of a big wondrous musical landscape consisting of 60's & 70's pop & rock - not to mention the indescribable joy of presenting our own songs to appreciative audiences - and I must say ... with the appropriate biggish dose of melancholia ... it's been an honor to have accompanied my great pal Davey on this trek. He is truly an accomplished musician, an enthusiastic performer, a jack-of-all-trades -and- a master-of-all-trades, too; let's see ... what else? ... he's the truest of friends, a humanitarian of the highest order, and just an all-around, gol-dang, nicey kind-of-guy. Plus, he's a non-smoker, so he doesn't stink up the joint. In any future project he tackles, he will certainly achieve massive levels of success, which would naturally be commensurate with his naturally lofty abilities - naturally! There is no one on this earth who deserves success more than he. (Besides me, that is)", he added softly out of the corner of his mouth, with an impish side-glance to nobody in particular. Davey raised his right hand and said, with his own impish, loudish emphasis on the first few words, "Well, except for that soft aside at the end, I swear every word Tommy just said about me is absolutely, unequivocally, indubitably, and undeniably the truth, the whole truth, and nothing but the truth, so help me, God." Then, with a wink, he turned on his heel and strode right out the door, closing it sharply with a pronounced chee-emph! Tommy and I stared silently at the door for 15 seconds, waiting for Davey to return and reap the rewards of his very funny Unexpected Exit stunt ... but ... nope, no return. After 10 more seconds, Tommy turned to me with a twinkle in his eye and said "Yup. That's Davey". Then he, too, effected his own Unexpected Exit. Thirty-five seconds later, and I'm still standing there, alone, staring doltishly at the door. I hypothesized the interview was over.